There were plenty of smiles, handshakes and hugs as the Picton Pirates doled out the hardware that commemorated the 2018-19 season. One of Picton’s best campaigns in recent memory was feted at the Rotary Club of Picton Hall with the annual awards banquet Saturday evening and, while the arch rival Napanee Raiders are still on the ice, charging their way to an Ontario Hockey Association Schmalz Cup championship, there was more than a modicum of satisfaction to be taken in the proceedings. Through 60 regular season and playoff games thus far, the Raiders have lost just five times. A total of three of those losses came at the hands of one of the Tod division’s youngest teams. As an organization, Picton had plenty to celebrate in 2018-19. The club sent six players to the annual PJHL showcase in fall and blueliner Derek Vos was named Tod Division defenceman of the year while forward Landon McLellan was a runner up in the Rookie of the Year voting and coach Tyler Green was a finalist for the division’s top bench boss. 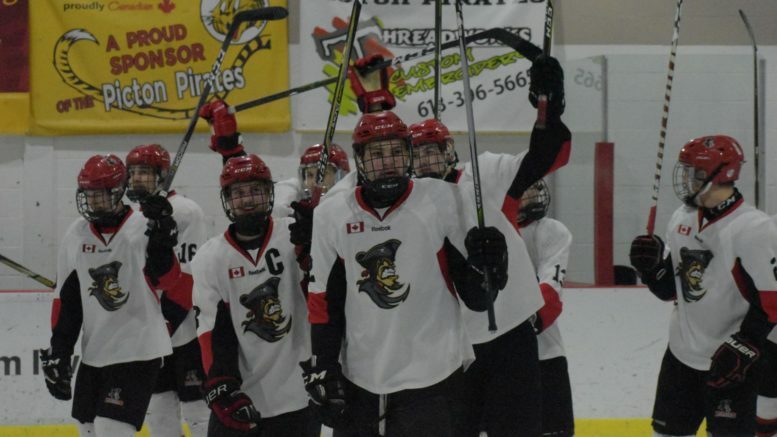 The second seed Pirates took down the Amherstview Jets in five games in the Tod Division semi finals to win its first playoff series in five post seasons. 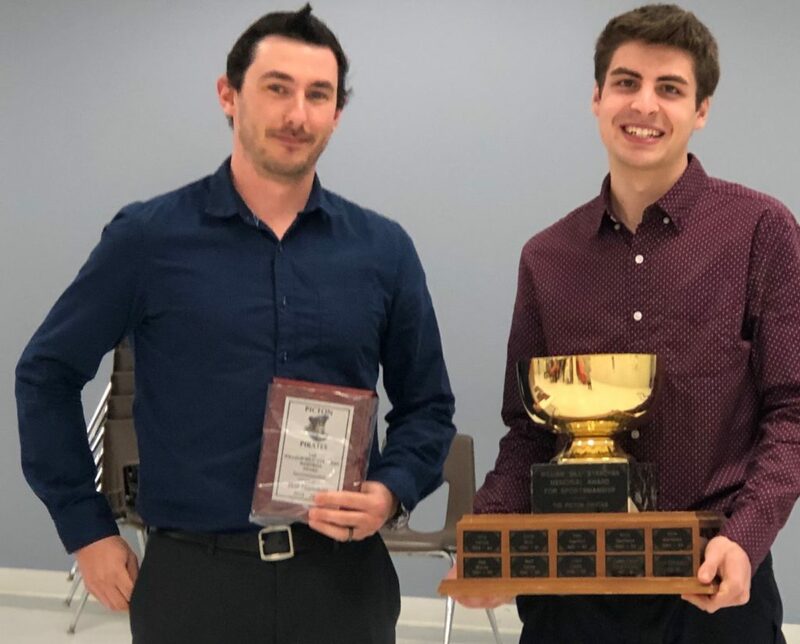 McLellan was one of two Pirates recognized twice on Saturday night, taking home both the Lionel F. Hicks Memorial Award as club MVP and the Walter Norton Memorial Award as Picton’s top rookie. McLellan, 18, had 26 goals and 20 assists for 46 points in 43 regular season games and added four goals and four assists in nine playoff contests. A testament to the Shannonville native’s trajectory and development to date is that he stopped by to pick up his awards on Saturday night after playing as an affiliated player for the Wellington Dukes in Game 1 of the Ontario Junior Hockey League’s Jr. A Buckland Cup Finals a night prior. 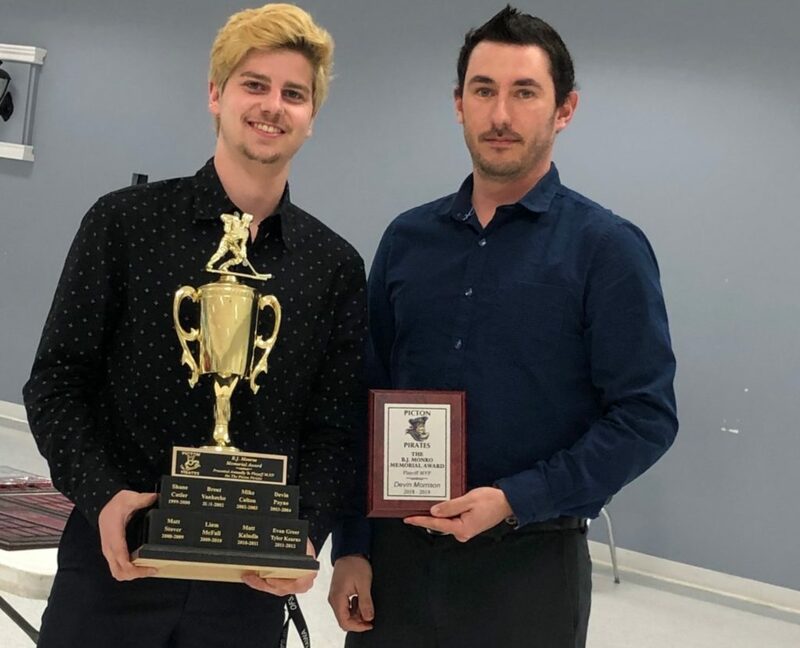 Picton native Will Harrison killed penalties with McLellan all season long and the fourth year forward also picked up a pair of awards Saturday night, capturing the Matt Stever Memorial Award as best defensive forward and the Bill Strachan Memorial Award for most sportsmanlike player. 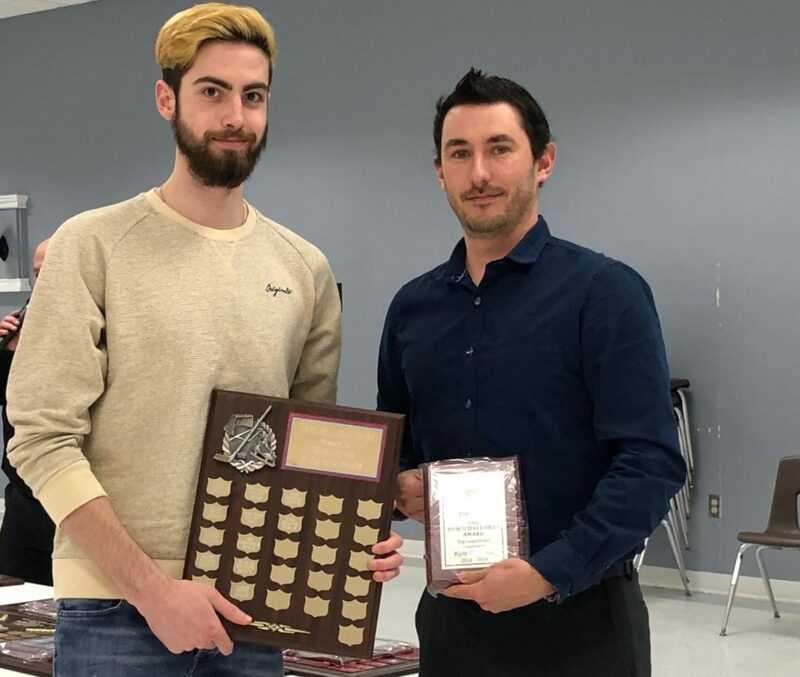 After winning the sportsmanship award four times in four seasons, Masterson joked it might be time to rename the award in honour of Harrison. County native Kurtis Wood went home with the Ivan Stringer Memorial Award for dedication and commitment. Masterson said Kurtis and the Wood family do everything they can to help the Pirates, including spending time and their own money to rebuild the inside of the Pirates dressing room this past off season. “(Wood) attends every off ice event and takes being a Pirate to heart. He’s a Pirate through and through and dedicated 100 per cent in everything he does,” the General Manager added. The Wayne Lindsay Memorial Award for most improved player went to defenceman Connor Kennedy. The Madoc native suited up for 41 games this season, potting three goals and adding 12 helpers for 15 points. Masterson said Kennedy found his niche in the back half of the regular season, providing important minutes on the Pirates blueline. 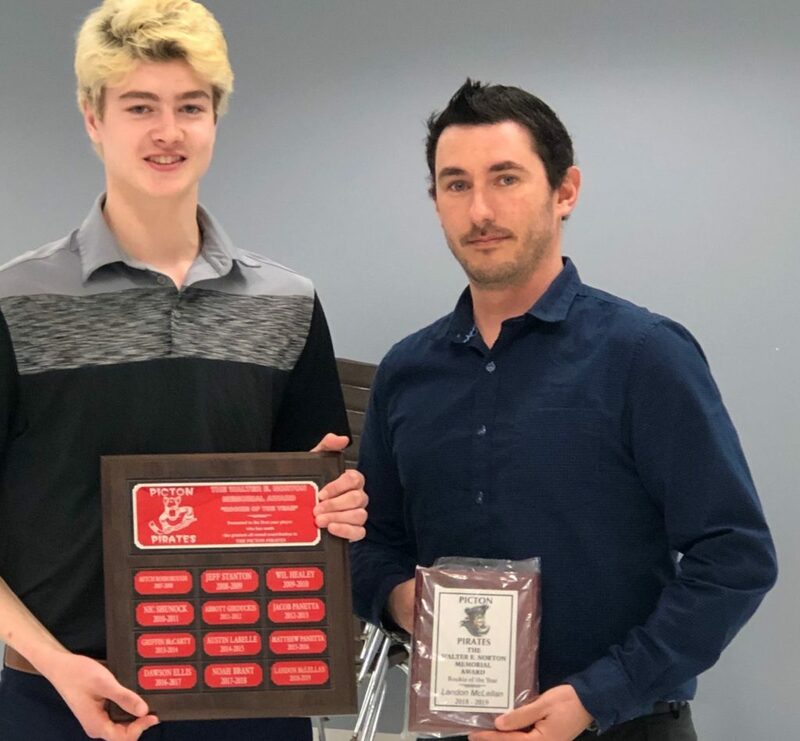 Griffen Conger’s Bobby Hull Award as top scorer was academic as the Deseronto native put up 54 points (21 goals + 33 Assists) in 39 games in his first season in Picton. The veteran came over to the Bucs at the start of the season after two campaigns with the Raiders and while Picton had to deal a prospect in Bailey Maracle to get the services of Conger, it looks like the deal paid off for the Pirates. Another Pirate that’s managed to play his way into the Wellington Dukes lineup this post season in a back up role is netminder Kyle Renaud. The Woodlawn, ON native came to Picton in mid-December and was spectacular during his time in a Pirates uniform, posting a 9-2-1 record with a 2.39 Goals Against Average and a .926 save percentage. For his efforts, Renaud earned the Tom O’Hallaran Memorial Award as Picton’s top goalie. Vos was selected as the Andy Cronkwright Memorial Award winner as the club’s top defenceman. In his first year of junior hockey, Vos scored four goals and added 23 assists for 27 points while playing top line minutes. “It’s really a no-brainer, he had 16 powerplay points and was outstanding for us on so many occasions,” Masterson added. In terms of playoff performers, team captain Devin Morrison was the club’s BJ Munro Memorial Award winner as the post season MVP. Morrison was the co-leader in points in the playoffs, potting three goals and adding five helpers for eight points in nine playoff games. Masterson recalled the critical Game 4 of the Tod Semi Finals after Amherstview had beaten Picton at home in Game 3 to get back into the series. With the momentum pendulum in motion, Morrison posted a hat trick to lead Picton to a 6-3 win, paving the way to a series victory for the locals. “I remember that game and he was injured with a bad back and he carried us through that game and it was such a key game and a key performance in our playoffs,” Masterson said. The Belleville native will be off to school in eastern Ontario this fall and it appears he will be signing with a Jr. A hockey club in the Ottawa area. 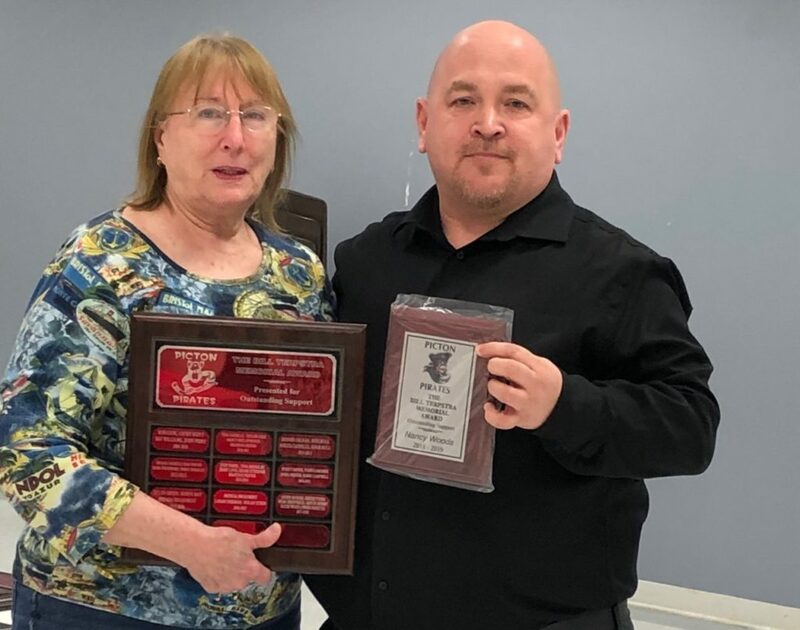 Finally, the Bill Terpstra Memorial Award went to long time volunteer Nancy Woods. Masterson was correct when he stated that without Woods, there simply wouldn’t be the Picton Pirates. Picton will take to the Lehigh Centre ice for it’s annual spring development camp May 1 and 2 from 7-9 p.m.